When Jackie and Iam Heys of the UK went out for dinner, a fire broke out in their home around 7pm. The roof and most of the house was destroyed, but they managed to save a box of mementoes of their only daughter who had died of a rare cancer when she was eight-years-old. 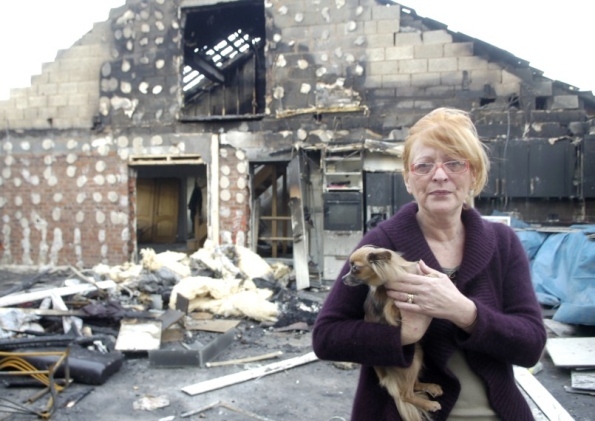 They were able to save two of their Chihuahuas, but they were sure that Lily had died in the fire. However Lily had scrambled into a kitchen cupboard and hid for 15 hours under a blanket as the fire raged through the bungalow. The next morning they asked a fireman to retrieve her body. …he walked towards us with her in his arms and she moved. He’d found her in the kitchen cupboard. She was as black as coal. I held her and cuddled her, then she went up to the fireman and started jumping up at him, almost as if to say thank you. Posted on January 2, 2012, in news and tagged animals, chihuahua, fire, pets, uk. Bookmark the permalink. Comments Off on Chihuahua survives house fire hiding in cupboard for 15 hrs.